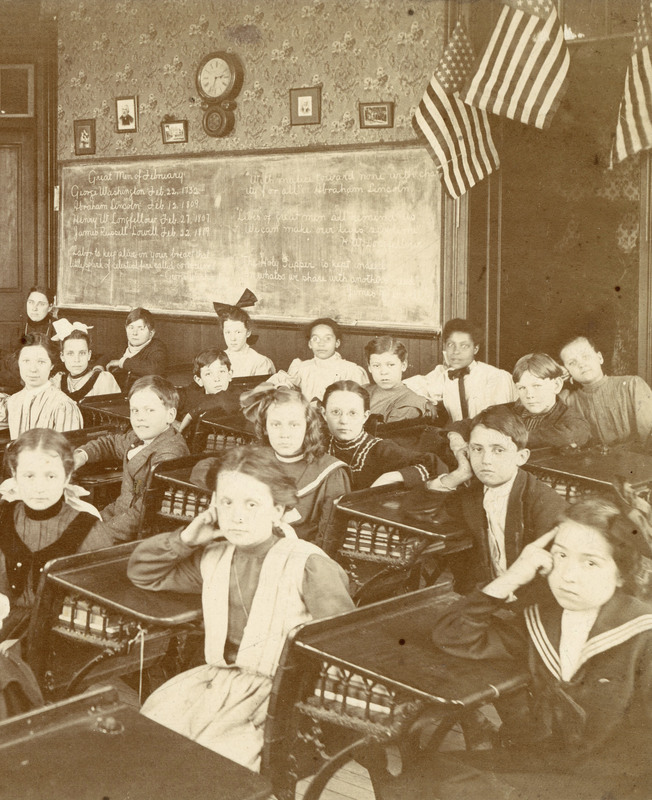 On February 21, 1906, an unknown photographer created this time capsule of the inside of a fifth-grade classroom. The photo is mounted on a card, on the back of which is a note: “Leighton’s First School, Bellefontaine, O.” The writer first wrote “Fountain City, Ind.,” but crossed it out. 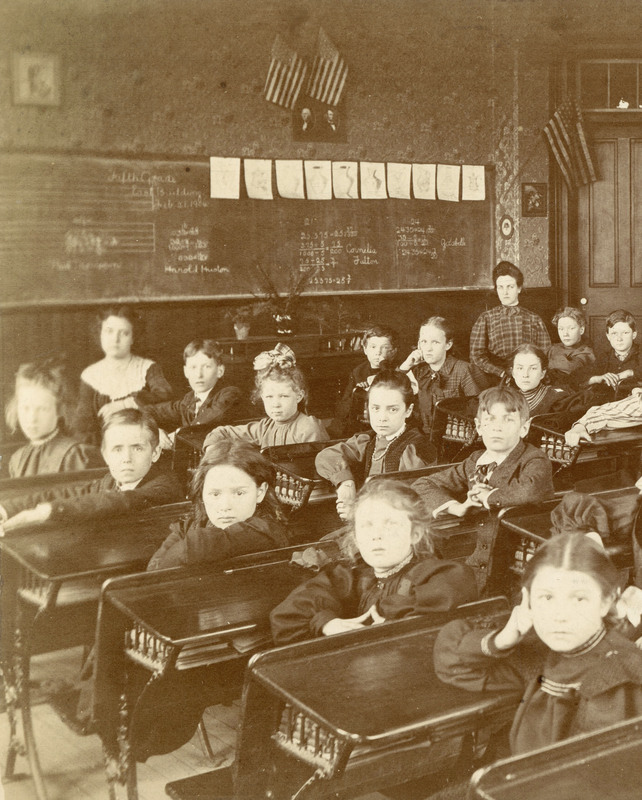 At upper left on the chalk board on the left side of the room is the following: “Fifth Grade, East Building, Feb. 21, 1906.” Below and to the right, on the same board, are three math problems with names of students in neat script next to them: Harold Huston, Cornelia Fulton, and Zolabelle. George Washington Feb. 22, 1732. Abraham Lincoln Feb. 12, 1809. Henry W. Longfellow Feb. 27, 1807. James Russell Lowell Feb. 22, 1819. With malice toward none with charity for all. In whatso we share with another’s need. Was the little girl in the sailor’s outfit trying to tell us something by pointing to her forehead? OK everyone, time for recess! Hope you’ve enjoyed this quick trip to Ohio. Come back and visit anytime. The classroom was mixed race, which was progressive for the time! I wonder how unusual it was in smaller towns like Bellefontaine? There’s another mixed-race classroom photo on the blog, from the town of Thomaston, Maine (see the African-American tag). Educational segregation in the North may have been more of an urban phenomenon. I don’t know why smaller towns would have been more progressive on racial issues than larger ones but it’s a very interesting question! Photographs of children are one of my favorite genres! They change so quickly…. When you see a photo of a child, you know the child was only like that for a short time. As far as smiles go, it was certainly true that people rarely smiled in the early days, for the reason you mentioned. Smiles start to appear toward the end of the 19th century, when equipment was much faster, but they were still relatively rare. Which is to say, people could have smiled more than they did. I think the formality of studios was a deterrent. It was only in the 20th century that smiling became commonplace, as far as I can tell. I didn’t know that about the timeline on the appearance of smiles. It makes sense though. I love the ones of children too! The teacher looks as though she kept a very tight rein on the children’s behavior. The bows in the girls hair! Darling, aren’t they? Everyone is dressed up for “class photo day.” A couple of the boys even appear to be wearing ties. Yes! That’s probably the main reason I love portraits of children, especially in groups like this. You can often see a variety of reactions to being photographed, including nervous apprehension, curiosity, boredom, irritation, and delight. Lovely photo, Brad. As well as the kids, I love those desks and the way they’d have been able to read the titles of the books through the sides. Can you make out any of the book titles in your largest scan, or are they not legible? Thanks, Val! I agree, the desks are really nice. It appears that the writing area is attached to the seat in front, rather than the seat behind. I hadn’t noticed that until you commented. I can’t make out any of the book titles, unfortunately. That’s a very unusual arrangement. I’ll have to take another look! Thanks Jadi! I just tried to leave a comment on your new post, but each time I tried, I got a dialog box telling me I was about to download a WP file. Weird! Just a glitch, probably. I looked for a way to contact you about it but didn’t see one on your blog. Some of those hair bows! Seeing little details really amplifies the feeling of looking into the past, doesn’t it? Like studying a photo from a silent movie set and seeing things moviegoers wouldn’t have time to notice. Thanks for looking! !